I think I need to apologise for my recent quietness, I was working on 2 big projects which I learned a lot from, maybe even things that I’ll post about here for the geekier people following my blog to read, and (maybe more importantly) so that if I ever need to remember something cool/useful that I learnt doing this, I can read to remember it. To save this from being a somewhat redundant post where no value is added I’d like to mention that you should not be shy when adding the oil/milk unless you like dry brownies and that if you are preparing more than 1 cup you might like to increase the time on the microwave or do them one cup at a time otherwise you end up with a cup of un-baked chocolate goo, which is arguably not such a bad thing… I have yet to test if the cocoa can be safely substituted with Milo. If you don’t have any cocoa you can use Milo. 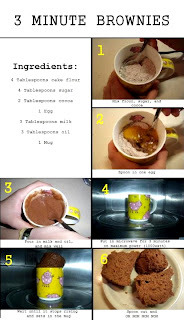 I have tested this and the result is a bit strange but I think you can still call it a brownie.